We Leave Anghiari | Sprezzatura, Y'all! Today we leave Anghiari. We’ve rented a car to take us, Millie, and seven suitcases to Rome, where in two days we’ll leave Italy. Leaving Anghiari is hard. It’s harder than it was leaving Georgia back in August. Then we were leaving to embark on this wonderful adventure, and we knew we were coming back, so it was very exciting. Now our adventure is almost over and we feel like we’re leaving a part of ourselves here. We have no definite plans to come back. Only dreams and desires. We really feel like we’re just getting started and now we have to end it. Anghiari has become like home to us. We’re comfortable here and we both swear that the language is just starting to click. If we were to stay, we’d be able to communicate pretty well. The daylight hours are lengthening now, meaning winter is almost over and soon spring will be here. We’re starting to see postings for more festas and events, a sure sign that we’re moving into warmer weather. Here, Carnevale, or Mardi Gras, is the signal that the long winter is waning and life outside begins again. It breaks my heart to see the posters for the events coming up in the next few weeks, knowing they’ll take place without us. If we were here, we’d be front and center, taking pictures with our camera and our minds, experiencing more of the traditions which define this place. But our time here has come to a close and the spring events will go on without these Americans and their dog. As we’ve gotten to know the people and the community, the secrets of the place are starting to reveal themselves to us. It’s just like any small town. Think Peyton Place, Italian style. For instance, there are town characters, as in any town. One of the ones here is a little old man (we can never remember his name) who lives in a very nice house at the top of town. 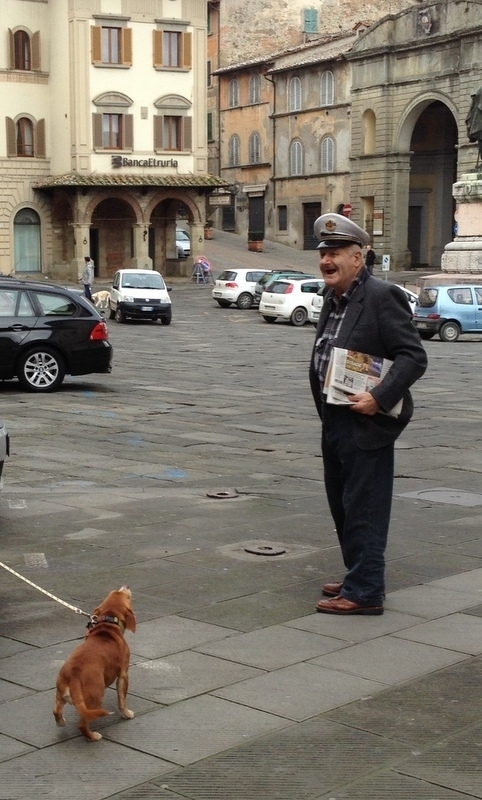 He is a very special person – he walks (well, really he shuffles) around town almost all day everyday wearing a hat with a military crest on it – reminds us of a sailor hat. His family was very wealthy and he owns lots of property around the area. He lives in his house with help that comes in and takes care of him and he walks around town all day. On Sundays, he goes to church and sits up front with the altar boys/girls. On Monday for the very first time, he stopped and talked to us. We have always nodded to him and said “Buon giorno”, but he’s never responded. Today, for some reason, Millie barked at him. He thought that was very funny and stopped and talked to Steve and Millie. Very nice. As we head to Rome and see Anghiari in our rear view mirror, we know we are leaving part of ourselves there. This was our home – the only home we had – for six months. It was a good home and a place we felt comfortable. We learned so much about Italians and Italian culture. We were pleasantly surprised to learn about all the traditions and rituals that we participated in. Italy is not perfect by any means, but the people here do enjoy life. If I take anything away from this experience it’s that. They seize every opportunity to celebrate and come together. They believe in music, food and comaraderie. And they believe in it so much that they do it often. Almost every event and festa is rooted in a celebration, a memoriam of a legend or victory, and almost all of them have religious origins. It’s a land of traditions and if you ever visit here, find out what’s being celebrated while you’re here and participate. Don’t be one of those tourists who has a list of things they want to do or see because the guide books say so. Strike out on your own. Initiate a conversation with a local and see where it takes you. Just a few days before we left Anghiari we were walking outside a beautiful old house at the top of the hill. It’s a local landmark and is enclosed by a gate and tall trees so that you really can’t see it. As we walked by, the gate opened and an older gentlemen said hello. The next thing we knew we were getting a tour of the house and the gardens. He spoke no English, but we managed to understand most of what he was telling us. Why did he welcome us into his home? Two strangers with a dog. It’s possible he had heard of us – not because we’re famous, but because we’re noteworthy. Maybe he’d seen us around town and knew our story. Whatever the reason, he was as kind and welcoming as could be and it was a special treat for us to see this mysterious property that we’d always wondered about. Once you step outside your usual boundaries, there’s no telling where you’ll end up. Anghiari – our Italian home. We have loved everything about living here and will miss it tremendously. Here are a few reasons why. Remember always do what you love. Never do what you don’t love. Oh Cathy, your hearts must be so full! You will be back for sure, I know it. You will probably retire there. Trust me…. You have inspired me to also travel to Italy, the home of my lineage. So thank you for that and the lovely stories of food, friendship and fun! I am so grateful to have had the good fortune to share a tiny slice of this beautiful adventure in Anghiari! I too fell in love with this charming town and its gracious people!